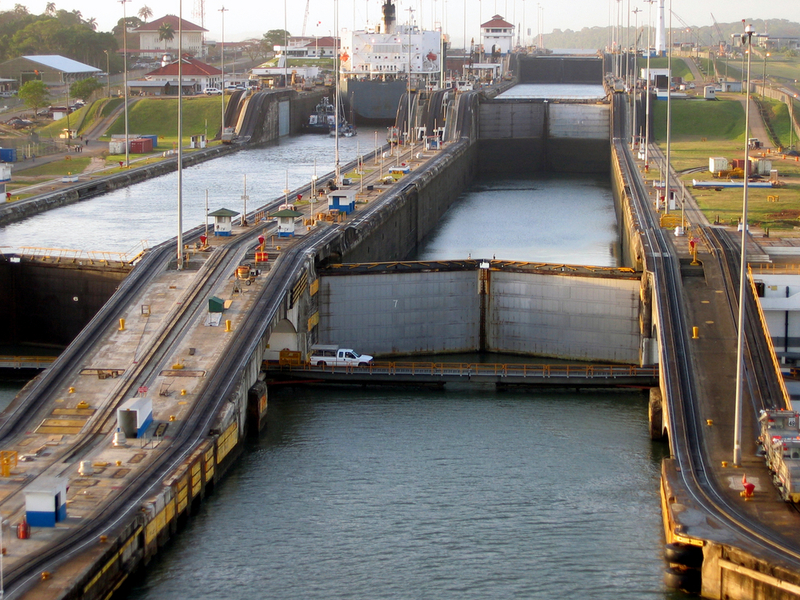 Jill A. asks: Why does the panama canal have locks? Isn’t the ocean the same level on both sides? Rising 85 feet above the surface of one ocean, and then descending again to be gently floated on another one, ships that traverse the Panama Canal shave nearly 8,000 miles off of their voyage to the other side by investing a long workday climbing up, and then going back down, the Isthmus of Panama. Made possible by a handful of locks, despite the extreme expense for commercial vessels to traverse it, about 5% of all the trade in the entire world passes through this early 20th century engineering marvel. Where the Canal sits, the Isthmus of Panama is a mere 51 miles across. Compared with the Suez Canal, which was twice that length when first constructed in the modern era in 1869, the shorter Panama Canal was expected to be relatively easy to build when first envisioned in 1879. And, since those visionaries had successfully completed the sea-level Suez Canal, they planned on making the man-made waterway that would join the Atlantic and Pacific Oceans in the same manner (i.e., at sea-level). Sea-level canals are precisely what the name implies – the channels are dug sufficiently deep that their water surfaces are the same level as that of the bodies of water that they join– and to accomplish this, a great deal of earth is removed. In the construction of the sea-level Suez canal, approximately 600 million cubic feet of stuff was removed from the land, and more dredged from the adjoining bodies of water. With that French-dug channel that joins the Mediterranean and Red Seas taking only 10 years to complete in middle of 19th century, many thought a similar channel across the far-smaller Central American peninsula would be a snap. In one of the western world’s greatest examples of hubris, they could not have been more wrong. Diplomat and engineer Vicomte Ferdinand Marie de Lesseps was instrumental in building the Suez canal, and he led the initial work on the Panama Canal as well. Disease and construction delays hampered the project, and after nearly seven years, only a few of the hundreds of feet of excavation necessary had been accomplished – and this just from one part of the channel. Yet even with these dramatic failures, it still took de Lesseps another two years before he agreed to consider the construction of locks to help solve the increased elevation in the middle, thus reducing the amount of excavation needed between the two sea-level sides. But even then, the locks were intended to be a mere temporary solution while the digging for the sea-level passage continued. Interestingly, the person chosen to construct the locks was none other than Gustav Eiffel (who built a tower in Paris the next year for the 1889 World’s Fair), but it was already too late for the Central American project. Compagnie Nouvelle, the company funding the work, went bankrupt in 1888, and de Lesseps’ died in disgrace shortly after. Understanding the immense value such a canal would have to the United States, President Theodore Roosevelt committed to the construction of the Canal, and in 1903, negotiated the Hay-Herrán Treaty with Colombia (which owned the canal zone at the time). Wisely, the Columbian Senate feared the United States would use the opportunity to seize even greater political power in the country and refused to ratify it. Undeterred, the U.S. then aided a Panamanian nationalists’ rebellion (including stopping American-owned railroads from transporting Colombian troops and sending the Nashville, a U.S. warship, to protect the rebels). On November 6, 1903, the United States recognized the Republic of Panama. Twelve days later, a new treaty, the Hay-Bunau-Varilla, was signed, and it granted the U.S. permanent and exclusive possession of the zone (in exchange for a $10 million signing bonus, or about $255 million today, and $250,000 annually beginning 9 years later). Work was slow-going over the next few years with efforts focused on revamping the 60-year-old railroad and improving working and living conditions. The locks were begun in August 1909 with the construction of the Gatun locks (on the Atlantic side). 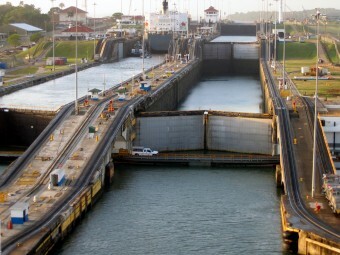 Consisting of over 2 million cubic yards of concrete, at Gatun there are three sets of paired locks (the Canal is actually two parallel channels that, in principle, would allow two ships to pass in opposing directions at the same time). Each lock is 1,050 feet long and 110 feet wide, and together they are placed consecutively, like watery stair steps, to ultimately raise (or lower) ships the 85 feet between the highest point on land and the oceans’ surface. As a ship enters a lock, over 25 million of gallons of water is added to raise the boat to a level sufficient to allow it to enter the next lock; walls that are anywhere from 45 to 55 feet thick at the base and tapering to just 8 feet at the top hold all of this water in. This process repeats twice on either side until the ship reaches the plateau where it sails across the isthmus toward the other set of locks to repeat the process, but in reverse, where water is drained to lower the ship at each step. On the Pacific side, there is a single lock near the apex at Gatun Lake called the Pedro Miguel, then two others down to the ocean at Miraflores. Ships enter via two-pair of large, yet relatively lightweight and buoyant, 7-feet-thick gates that vary in size depending on conditions. The heaviest and tallest gates (662 tons and 82 feet high) are at Miraflores where the tidal range varies greatly; in fact, at Miraflores, the difference between extreme high and low tides is so great, depending on conditions, a boat may need to be lifted (or lowered) as much as 64.5 feet or as little as 43 feet; the remaining Pacific lift, at the Pedro Miguel lock, is a consistent 31 feet. Likewise, on the Atlantic side, the lift of the three Gatun locks remains relatively stable at 85 feet in total. Remarkably, ships require only 2 feet of clearance on each side of the Canal, such that, in the 110-foot wide area, a boat 106 feet across may traverse – although not necessarily without a bit of anxiety. The maximum length of a ship allowed in the Canal is 965 feet, and the maximum draft is 39.5 feet. Together, these maximum specs are known as the Panamax. This is small by today’s standards of commercial ships, and although some massive ocean vessels routinely carry 18,000 containers, the largest that can pass through the Canal will hold less than 5,000. To continue to remain relevant, the Panama Canal is expanding. To be completed in 2016, the new canal will have a new set of locks that will be 180 feet wide and 1,400 feet long, with the new post-Panamax capable of ships as big as the largest that traverse the Suez Canal today (which can handle ships large enough to hold about 13,000 containers). An economic boon to many when completed, experts say the biggest winners from these new locks will likely by the United States’ natural gas industry, which, today, is unable to send its enormous tankers filled with liquefied natural gas (LNG) through the Panama Canal; when the new locks are completed, these massive tankers will have easy access to lucrative, and growing, Asian markets. Interestingly, due to currents and other such factors, the Pacific around Panama is on average about eight inches (20 centimeters) higher than the Atlantic, meaning that if a sea-level system was dug, there would be a significant current flowing from the Pacific side to the Atlantic side. Tidal currents would also present something of a problem for ships in this case. If you’re wondering how much it costs to go through the Panama Canal, this varies greatly depending on what you’re hauling and the size and type of ship. But, for ballpark reference, if you’re a commercial ship carrying around the maximum 5,000 containers, you can expect to pay a bit under half a million dollars when all the fees are added up, give or take depending on several different factors. On the other hand, if you’re on a cruise ship holding, say, 1,000 passengers, the cruise company is going to be paying close to $150,000 for the short cut. That said, if you’re just out on your own little private boat, depending on size you can expect to pay around $1,000-$3,000 or so to go from one side to the other. What would happen if they unlocked the Panama canal? What’s going on with the world’s canals? Thanks. The article didn’t say clearly that basically, there are hills/mountains on the way, hence the need to have the locks – with them, the depth of the canal can be made the same, but at the price of building the locks.